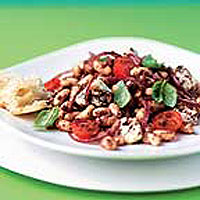 Cannellini beans form the substantial base to this main-meal salad, making it a good source of protein. Mix together the olive oil with the tapenade, then stir in the cannellini beans until they are evenly coated. Lightly stir the plum tomatoes, red onion and Gorgonzola into the bean mixture. Divide between 4 serving plates. Heat the ciabatta according to the pack instructions. Season the salad, scatter with a few fresh basil leaves, and serve with the warm ciabatta. Cannellini beans have a creamy texture which makes them a good choice for salads. However, in this recipe you could use meatier borlotti beans instead.